How many different kinds of turf are there and which one is right for me and my specific needs? How realistic does fake grass look? Where can I find a reputable company or contractor in San Diego? The easiest way to get all of your questions answered is to simply pick up the phone and give us a call @ 858-384-4502 or send us an email. Otherwise read on as we have a lot of useful content on this website to answer many of the questions you may have. WATER WISE GRASS: WHO ARE WE? Water Wise Grass is an experienced, locally owned and operated business servicing the greater San Diego, California area. Our company has 25 years experience and our services include the installation of all types of synthetic grass for all of your landscaping needs: artificial grass lawns, backyard putting greens for golf, pet turf, playgrounds, athletic sports fields, other speciality turfs as well as pavers. We can even help you with your landscaping or work with your landscape architect or designer to make everything come together just the way your envision it. We can help you save some serious time and money. Just think for a second of the amount of time it takes to consistenlty maintain your lawn with mowing, watering, and fertilizing every week, month or even year. Now think about all of the money that it costs to do all of the maintenance. You may do it yourself or you might hire a service to do it for you and in the end how good does your front yard or backyard look? If your like most people in San Diego you may have problems with a brown yard, dead spots, dogs or other pets tracking mud into your home on a rainy day, expensive water bills. The list goes on and on. Now imagine for a second you have a PERFECT looking vibrant, lush, green synthetic lawn year round! On top of that you never have to mow, water or fertilize your front or backyard again. In addition you are helping conserving water which is a serious problem in California right now! Think of all of the time and money you would save with your artificial grass yard! No lawn care maintenance fees! Save Money – Lower Water Bills! Low Maintenance – Save Time! Our Water Wise Grass installation crews have more than 25 years experience. We only employ the best San Diego artificial grass installers, paver crews, landscapers, landscape architects, designers and irrigation specialists. We have probably encountered every problem you could imagine in the past and know how to deal with uncommon issues. Our staff has outstanding attention to detail and we take tremendous pride in every job we complete! One of the things that separates us from our competition is our pricing. We are very efficient operating our company and eliminating unnecessary costs and overheads allowing us to give you the absolute best prices. Not every turf is made equal so it is important that when you are comparing prices that you understand the differences in products and installation processes. Contact us now to get a Quote! Our installation crews have more than 25 years experience. We only employ the best San Diego artificial grass installers, paver crews, landscapers, landscape architects, designers and irrigation specialists. We have probably encountered every problem you could imagine in the past and know how to deal with uncommon issues. Our staff has outstanding attention to detail and we take tremendous pride in every job we complete! 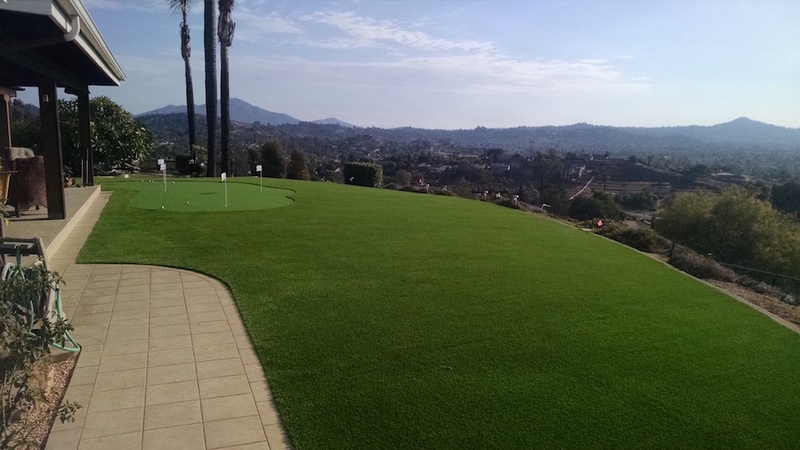 best artificial grass company in San Diego! Water Wise Grass also specializes in the installation of pavers. Whether your looking to install permeable, interlocking, belgard pavers on your patio, driveway or pool deck, we can help you add value to your home and increase your home or commercial property’s curb appeal! With our landscape design and hardscape expertise we can help you select the right paving stones whether your looking for a brick, flagstone, concrete, travertine or other natural stone look! Your landscaping will look amazing when we are done and be rest assured all of our work is guarenteed. If you have questions, or would like a FREE ESTIMATE & DESIGN CONSULTATION for an artificial grass lawn, pet turf, indoor or backyard synthetic putting green, playground surface, pavers or any other landscaping service for your home residence, commercial or industrial property. Give us a call, Water Wise Grass: @ 858-384-4502, Request a Free Quote or send us an email.